What do you do when you have a whole fresh pineapple leftover from a party? This is a great mix of sweet and sour. Waiting to add the red bell pepper for last leaves them tender and with more bite than if you include them in the pressure cooking. 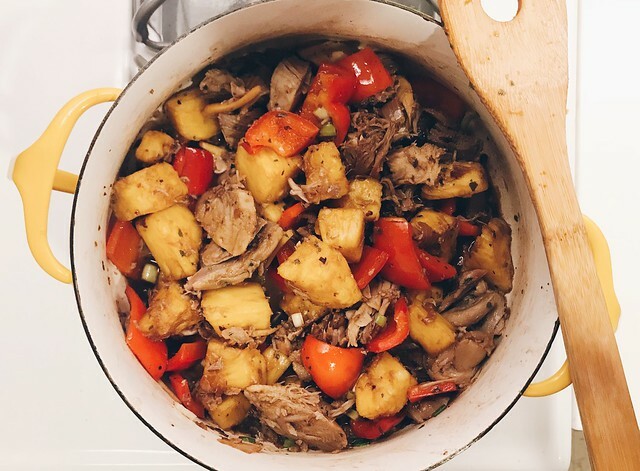 Same for the pineapple: they will cook just enough to produce more juice, but not so much that your stew is syrupy. This is even better the next day when all flavors have melded. 1. Using the sauté function of your Instant Pot, heat some oil. Sauté the garlic until golden brown, and then the onions until translucent. Add the pork and brown them on all sides. 2. Stir in the ginger and the soy sauce, and season with oregano, salt, and pepper. Add about 1/4 cup of water. Cover and lock the lid properly. Select the Pressure Cook function for 15 minutes. When it’s done, do a quick release after venting and letting the steam out. 3. Switch back to the sauté function. Add the pineapple and red bell pepper and cook until the bell pepper is tender. Season until you get a nice combination of sweet and sour.